Perhaps no food is more beloved by Norwegians than potato lefse. Prepared on special lefse griddles and turned with a long lefse stick, this paper-thin potato bread is best served warm with butter and sugar. Lefse is a traditional holiday food in among Norwegian-Americans in the U.S., so you might include it on the menu if you are entertaining guests for Christmas. It can be a family project, much like tamale-making, with different family members involved in rolling out the dough and cooking on the griddle. When you are selecting your potatoes to make lefse, ensure to use the driest, mealiest potatoes you can find. Peel the potatoes, making sure that no peels or eyes remain. Then coarsely chop them into 1-inch pieces. In a stockpot, bring water to a boil, add the potatoes and boil them until they are fork tender. Drain boiled potatoes well, then place in the warm oven for 15 minutes to dry them further. Mix in salt, heavy cream (or evaporated milk), butter, and sugar. Preheat a lefse griddle or cast iron griddle to 425 F.
Use a pastry blender to cut the flour into the chilled potatoes. Pinch off pieces of dough the size of a biscuit. An ice-cream scoop works well for this. Using a rolling pin with a well-floured sleeve and a floured pastry cloth or board, roll out each piece into a 12-inch circle. Carefully lift the circle with a lefse stick and transfer it quickly to the griddle. Bake the lefse on the griddle until brown spots begin to appear. Remove the cooked lefse to a plate lined with a damp clean cloth to cool. Cover with another damp cloth. Continue to cook the remaining lefse. Serve the lefse with butter and sugar. Lefse can also be frozen for up to six months. To freeze them, fold the cooled lefse into quarters, place them in zip-top freezer bags, and freeze. When you are ready to use them, remove them from the freezer and put them on a plate line with paper towels. Allow them to come to room temperature and reheat before serving. 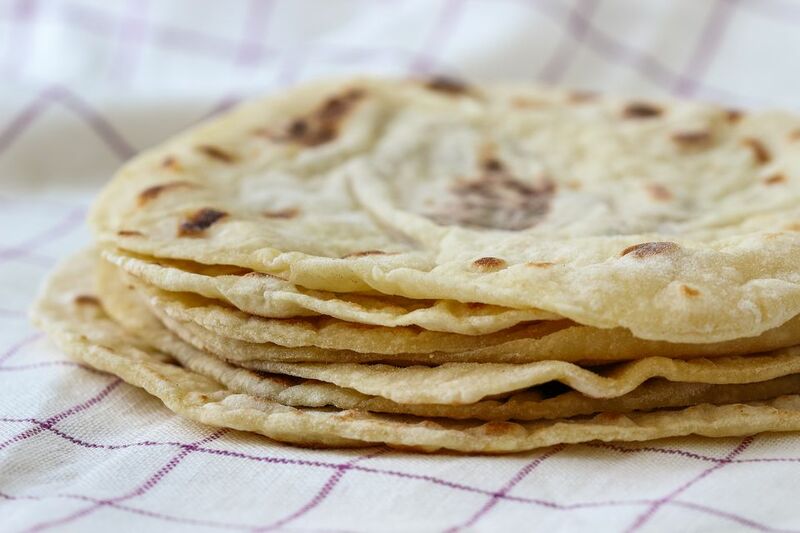 While the traditional way to eat lefse is simply with butter and sugar, you can use lefse in just about any way you would use a tortilla or wrap. Lefse can be filled with savory fillings like tuna salad or chicken salad for a quick lunch. Or, smear them with cream cheese and add deli meats or leftover cooked meat for a rollup. Enjoy them like a crepe with jam, Nutella, or cranberry sauce. Make a breakfast lefse with scrambled eggs and bacon. Feel free to be creative with this flatbread.